John Wade (1788-1875) was active in British reform circles throughout the 1820s. This group included people such as James Mill (the father of J.S. MIll) and other “Philosophical Radicals”. One of their key demands was to enlarge the franchise to include better representation of the new cities which had grown during the industrial revolution and to reduce the number of “rotten boroughs” which were very small electorates in the countryside which were dominated by the local landowners. 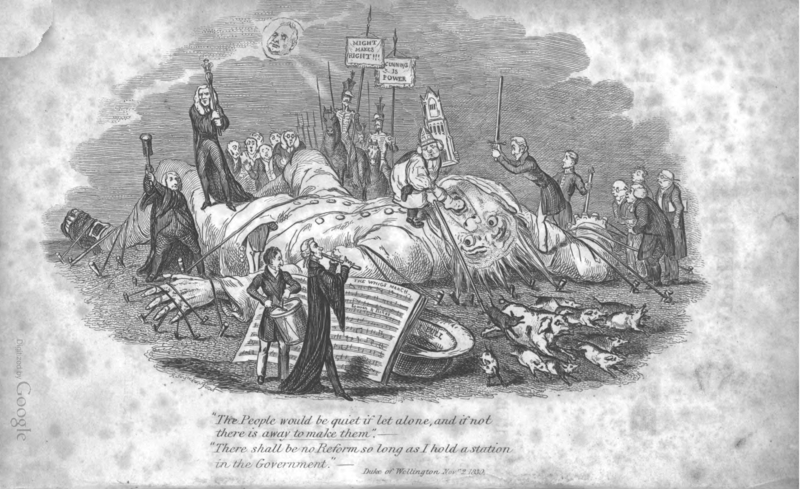 The First Reform Act of 1832 increased the size of the electorate by over 50%, enabling some 1/6 of the English population to vote. One reason why reformers like John Wade wanted a larger electorate was to enable them to protect themselves from the aristocratic and wealthy elites who benefited from the large number of government pensions, subsidies, monopolies, and other privileges which control of Parliament gave them. He chronicled these abuses in several editions of The Extraordinary Black Book, or Corruption Unmasked (1820-1835). The cartoon comes from the Appendix to the 1835 edition. In France too, there was agitation to enlarge the franchise and to weaken the power of the political elites from the aristocracy, the landowning and commercial classes, and the church. With the restoration of the monarchy in 1815 after the fall of Napoleon, the Bourbons were restored to the monarchy (Louis XVIII and then Charles X) and introduced a very limited franchise (barely 100,000 voters). Attempts by Charles X to limit freedom of speech and to compensate nobles for the loss of their land during the Revolution led to a popular uprising in July 1830 and the coming to power of a junior member of the Bourbon royal family, Louis Philippe who ruled from 1830-1848. 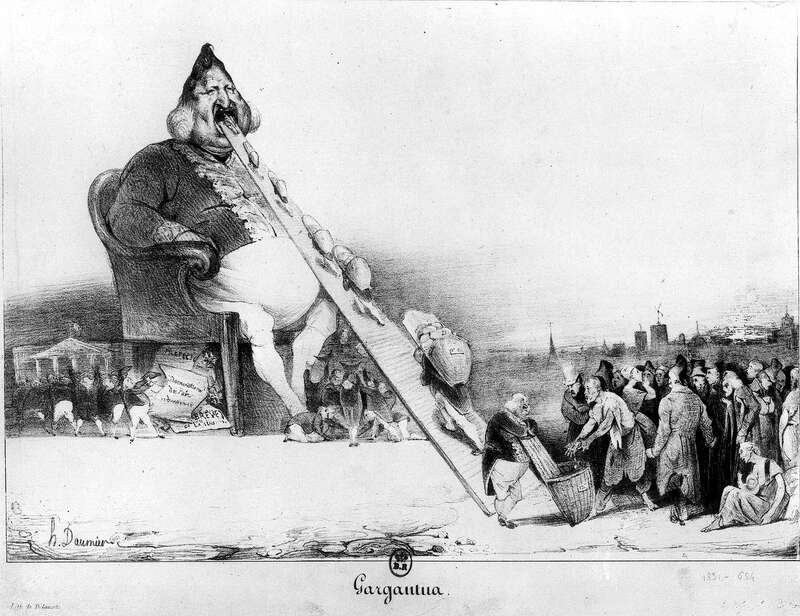 The political satirist and republican Honoré Daumier (1808-1879) thought that very little would change under Louis Philippe and so satirized the king (whom he often drew in the shape of a pear) in many etchings such as “Gargantua” (1831) which shows the people still having to pay for the privileges of the elite through their taxes. Daumier spent 6 months in jail for this depiction of the king. John Bull (i.e. the British people) has been captured and tied down (like Gulliver in Jonathan Swift’s Gulliver’s Travels (1726) by the Lilliputians, who in this case are figures representing the army, the church, members of parliament, and the judiciary. The Lilliputians taunt him and rifle his pockets to steal his money. Appeared in the satirical journal La Caricature 15 December 1831. King Louis Philippe is portrayed as the giant Gargantua (from Rabelais’ novel Gargantua and Pantagruel (1532)). The taxpayers (to the right) are loading baskets full of their tax money which are carried up a ramp into the king’s open mouth. Some well dressed citizens gather around his feet to collect the coins which fall to the ground. From the king’s commode fall official documents which grant various privileges and honours to those waiting below, before they rush off to the National Assembly. [an image from the Study Guide PDF which highlights important "Things to Note "in the image].